US Supreme Court Associate Justice Anthony M. Kennedy, Chief Justice John Roberts '76, Associate Justice Stephen G. Breyer, and Associate Justice Neil M. T. Gorsuch (top row from left) stand for a photo in front of the Harvard Law School Library Thursday afternoon. 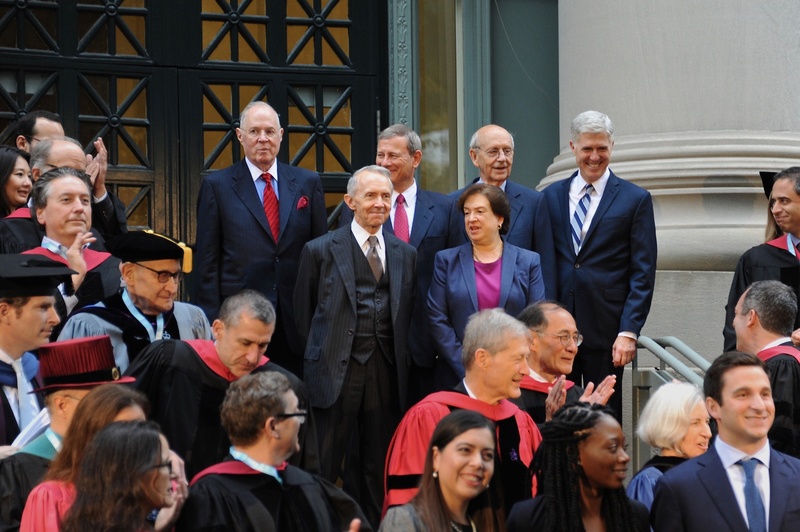 Retired Associate Justice David H. Souter and Associate Justice Elena Kagan stand in the row before them. Six members of the Supreme Court—one former and five current Justices—kicked off a marquee event of the Law School’s year-long bicentennial celebrations Thursday in Sanders Theatre. The Justices, including Chief Justice John G. Roberts Jr. ’76 and former Law School dean Elena Kagan, all attended the Law School as students and returned for the evening. 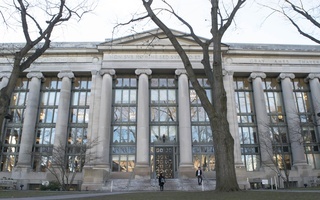 The event, billed “HLS in the World,” featured remarks and a question and answer session between the Justices and current Law School Dean John F. Manning ’82. Manning, who introduced the Justices, spoke about the school’s outsized presence on the Court and in other high-profile institutions. The Justices discussed the experiences that prepared them best for serving on the bench, listed former Justices they’d most like to have a meal with, and recounted memories of their days at Harvard Law School. Discussing the more technical aspects of her job, Kagan compared her approach in writing decisions for the Court to her time as a professor at the Law School. Justice Anthony M. Kennedy followed, expanding on the Court’s intentions with each of its rulings. “We write in order to inspire allegiance to the result,” Kennedy said. The Justices also offered advice to current students and alumni. Justice Stephen G. Breyer said that he most respects lawyers who contribute to society. Justice Neil M.T. Gorsuch, the Court’s newest addition, emphasized the importance of hard work in pursuing a legal profession. The summit’s events continue Friday and feature more than 60 sessions with speakers, including current senators, federal judges, academics, and alumni from a variety of legal backgrounds.